Here we go team. Given the multitude of RPs happening at any given time, I figured I might as well try my hand at GMing a story of my own. But this story, dear friends, comes with a twist! Any soldier worth his salt can successfully dispatch an army of faceless goons, but what happens when your targets suddenly become a tad more human? It is a well known fact that in New Eden there are no 'right' or 'wrong' choices. Everything is a shade of gray open to interpretation. More than anything I want Alcyone to experiment with ethics. There will be times where you will be faced with a variety of choices that you may be forced to make, and not all of them will be easy. Alcyone will focus on a team of skilled individuals infiltrating Shoashu Sasaanko, or "Snowfall Station" in the Tenal Region. A well traversed layover station by the Guristas, Shoashu has evolved over the years to become a one of the most exciting entertainment hubs across the sector. Whatever the vice, be it girls, drugs, or gambling, it can all be found in extreme abundance. And we are going to bring it all crumbling down. The initial insertion will consist of your character pretending to enter a mercenary hand-to-hand deathmatch, forcing you to rely on your less modified 'baseliner' form to survive until clone reserves are secured. This will lead to a series of unconventional tactics, accidents, and deaths. So, so many deaths, I assure you. Obviously to participate it is strongly recommended that you are familiar with all your New Eden lore and process a certain amount of creative talent. If this interests you, feel free to respond with a modified Character Sheet. No ridged structure is required, but I recommend you stick to a system to maximize the effect and depth of your character. If enough mercenaries are interested, I will begin sharing more of the fine details of this story that I hope to experience with all of you. Appearance: Stands 5'8" while baselining, known to wear a well worn olive drab bomber jacket covered with various military patches. Dropsuit Appearance: Customized Commando ck.0 outfitted with external short range heartbeat sensors and long range targeting computers. Rather than a typical steel rucksack, a compact nanohive is bolted to the rear of his suit. Insignia applied to left shoulder. Galm Fae is one of those atypical hybrids of a disillusioned ruffian and a dutiful patriot. His previous connection with the Templis Dragonaurs (while not condoned) proved helpful in providing State intelligence with Mordu's Legion documents and transmissions up until his exile from Pure Blind. Following a brief career in the Seituoda Taskforce Command, Galm deserted his corporation mere days before a public inquiry into war crimes committed by his unit in the Kor Azur region of Amarr space. The results of these inquiries however were regretfully lost in the weeks that followed during the infamous Purge. Having narrowly escaped death at the hands of deep cover espionage, terrorist cells, military tribunal, and political uprising, Galm fled into the Tenal region where he firmly planted himself in a Guristas spaceport. During this time Galm entered a downward spiral of drug and alcohol abuse to cope with the stress of both the Purge and the horrors he had witnessed in the Taskforce Command. After months of making a cheap living by fighting in Guristas gladitor matches, Galm fell in love with one Niina Eskola. When she did not immediately reciprocate his feelings he left the station to return to a life of mercenary work. In time however, Niina returned to him with open arms and the two are suspected to have eloped in early YC116. It would appear that their relation has brought a degree of stability to Galm, who quickly came to own several small businesses while fighting as a freelance mercenary under Niina's Eskola Ergonomics. Previous medical evaluations revealed several issues in Galms original set of implants, leading to a 'mental hangup' in the transfer of consciousness. This lead to fits of rapid onset dementia and anxiety attacks, driving him towards drugs to combat this illness. In time this discrepancy has subsided, stabilizing his behavior to mild neurosis. This improvement seems directly connected to his relationship with Niina, and begins to regress if the two fall out of contact for too long. Cunning, experienced, and jaded far beyond his years Galm has learn to transfer his utter apathy and contempt for his own life into a childlike disposition. Infinitely curious and easily entertained, he is perfectly capable of making his own fun and cracking a clever comment when the situation presents itself. Kirjuun! Uakan! Teknikiara! Kanpai kameitsamuu! Ra ra ra! Appearance: Pale skin in colour with a bald hairstyle. Has silver eyes with normal human pupils. Has a height of 1.7 metres. Wanted dead by the Gallente Federation after defeating Orion. Seen as one wearing a black, leather trench coat with a vintage timepiece trinket latched onto his left chest pocket. I'm in Galm, I'll get a CS up in a bit. Will post up lore in a minute. I like this theme..... will be odd seeing what Kador does when confronted with every vice he ever condemned in one single place. It's also rather well known that Kador is also not a very good hand to hand fighter. I'll take my chances in this RP as well as my own. Glad to have all of you on board. It'll give it a little bit more time before moving forward on this. And Aria... I really hate for this to discourage you from participating. Your writing style is decent, so it would be a shame to have you not participate. But there is an unspoken rule among anyone role-playing in Eve Online, and rule number one is that you are not a Jove. They have entirely reseeded from most empire space, and Templar One heavily implies that they have all been eradicated in a war against an artificial consciousness. Between Jove syndrome, Sansha incursions, and Sleeper remnants it is very likely that New Eden may never see a return of the Jovian Empire. Much less as an immortal soldier requisitioned by the Caldari. I hate to say it, but as long as you try to RP a Jove you won't be taken seriously. Whatever happens in that station will be pivotal canon to my character's story, and I don't to corrupt it with fluff. Either pick a different character, or change Aria's story. Green eyes, black hair, big ears, small nose. Thin lips, usually turned upwards at the edges in a small smile. Lean physique, not massively muscled. Freelance journalist who finds himself trapped in a station in Heimatar, cut off from all connections. Somehow gets involved in an underground criminal ring whilst trying to earn a living, caught, sentenced to death. A Valklear recruiter intervenes, for reasons he still does not know today, and offers the path of a Valklear as an alternative to death. He makes it out of training barely alive and wondering whether death would have been the better choice after all. As for the campaigns he undertook as part of the Valklears, there are few that he recounts. All he will recall is the story of how he, once again, faced death in one mission and was given a choice by the same character he had encountered so long ago. Death, or become an immortal clone soldier. "Some say you tell past Valklears from the average soldier by looking for the resolve in their eyes. Vyzion did not develop such hardened resolve, but rather the training nurtured his natural curiousity, bringing a softer, more inquisitive light to his eyes. He worked, to the derision of fellow Valklears, as a medic for the force, enhancing his earlier knowledge of medicine, and developing a prowess in logistical warfare." Highly curious, open to learning. Seeks knowledge in all its forms. Also possesses a slight weirdness and eccentricity; mutters to himself about things he normally should keep in his head, for example. Spends extended periods of time quiet and musing. Always willing to have a laugh, but can sometimes take things too seriously. > Quis custodiet ipsos custodes? He seems like a legitimately nice person, which is a rarity in the mercenary world. I actually really, really like that. Happy to have a medic on board! "You Gotta Shoot'em in the Head." Jarrad Kirk grew up in a fairly healthy, stable environment as a child. As one, he spent most of his days dreaming about space, challenging his mind and hopelessly pursuing women. Being the product of strong Gallente bloodlines and Minmatar heritage he grew up with an understanding of the importance of freedom. He believed in the importance of individual liberty to the extent that he felt the need to protect it. Despite his knowledge of despicable actions by the Federation's leaders he still joined the Federation's military thinking it was New Eden's only true hope for universal liberty and unity. While in the military Kirk became quite reputable as serviceman, far surpassing his fellow soldiers as well as his officers. 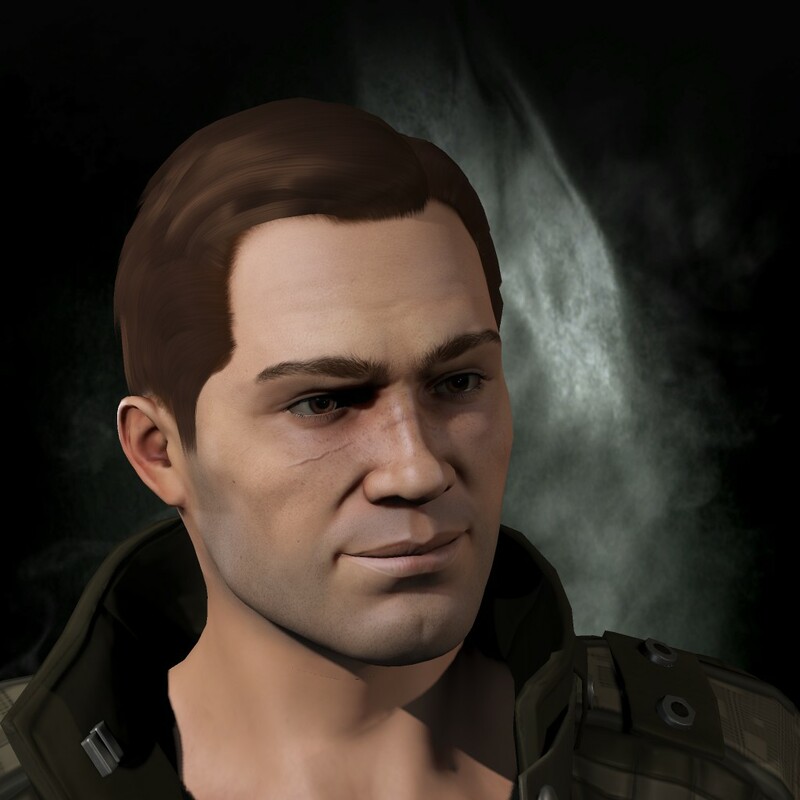 He received his moniker of Sgt Kirk by leading his remaining squadmates alive out of a botched Serpentis Installation seize as a newly enlisted soldier. By the time he reached the rank of Sergeant Major in the official military he came to the realization that the Ideals the Gallente people and the Federation's leaders were two different things. Being given more and more assignments that were not in the interest of the Gallente people but for their leaders he became frustrated and tired of it. And Aria... I really hate for this to discourage you from participating. Your writing style is decent, so it would be a shame to have you not participate. But there is an unspoken rule among anyone role-playing in Eve Online, and rule number one is that you are not a Jove. They have entirely receded from most empire space, and Templar One heavily implies that they have all been eradicated in a war against an artificial consciousness. Between Jove syndrome, Sansha incursions, and Sleeper remnants it is very likely that New Eden may never see a return of the Jovian Empire. Yeah... No... Nevermind pleasantries, this is unacceptable. Appearance: 5'11 , with light brown hair wildly cut, blue eyes . Wears a brown shirt with light green accents, dark gray cargo pants . Wears a sleek wristccomp of Caldari design with the engraved insignia of Condor squad. Wears a tribal necklace with the bone of a apex predator unheard of to the rest of new Eden. We are now officially up to an eight man team, which should be more than enough for our purposes. I'll get to forming a neat little bonus post before the real thing begins. Awesome awesome. Everyone please make sure you character sheets are finalized for tomorrow so I can write an opening post! Would this station happen to have an external gondola system or fortified emplacements. I'd really love kador to do his thing as opposed to a contrived infant r y story on my part. I also relish the opportunity to throw kador into some tough scenarios. I can already tell that Kador is going to have a WONDERFUL time visiting this place. AM. A. M. Cogito Ergo Sum! I think, therefore I AM. I was going to surprise you, but I guess I might as well tell you. If you've ever seen the inside of an Amarr station you know that certain stations have roads that connect sections together and are frequently used for transport. The thing is... In a Caldari station no space is wasted. The roads that do exist are likely to be a twisting system that ducks in and out of buildings and through a system of tunnels. That being said, it is entirely possible that a tank could be commanded through the twisting halls of Snowfall. It's just it would be so chaotic no one would ever see it coming. Which is exactly the point. Oh well no need for the winter high traction treads then. Just put a row of noisy, bloodstained chainsaws on the front. How would I upload a document to be provided as a link. Too much lore...... which would not make sense unless it was read in full...... will try to make a small blurb though. use google docs and publish it to the web then you can link it.